The hubster’s side of the family hosted our Canadian Thanksgiving celebration this past weekend, which means tons of traditions! As we do every year that we celebrate Thanksgiving with them (which admittedly is most of them), we swanned up to his hometown to enjoy a day of dawdling through a county fair with the whole family (yay for fuzzy-footed chickens and cows and equestrian events and greasy chip trucks! ), then we all headed back to the house to enjoy our usual Thanksgiving Day foods of turkey, stuffing, and mashed potatoes, with steamed carrots from their garden and boiled turnips. I actually like turnips when my mother-in-law cooks them; they’re not bitter but not too sweet either. But this post isn’t about turnips or turkey; it’s about the dessert! And that dessert was a homemade pumpkin pie, with a twist: some of my own apple butter that I had canned last year about this time. Pumpkin pie is all nice and good, don’t get me wrong; I’m not trying to impugn a classic. But sometimes (ok, most times), I like to tweak the classics and make something just a little bit different, to see if I can make something better-enough to create a *new* classic. This drives my purist husband bonkers, letmetellyou…. So yeah, apple butter. I wrote a post on a different blog last year on how to make apple butter, and thought it might be useful to resurrect it for my newer readers to see how it’s done. Why reinvent the wheel? That apple butter recipe is the shiznit, and I had so much product that I’m still going through my stash a year later. I think I’ll have to start using it up or giving it away faster, though, since next weekend I’m probably going to end up with another BUSHEL of “apple rejects” from the apple farm like last year! (Note: I receive — and pay for — all of the “imperfect” apples in several bushels from our Scouts Canada group, as we have our annual Apple Day next weekend, and nobody wants a bruised, dented, or slightly wormy apple! So, instead of throwing them away, I make lots of apple sauce and apple butter, and give it away to the Scouts, my friends and family, and in Christmas parcels). Ok, enough blather; on to the Apple Butter Pumpkin Pie! This pie serves 8, or 10 if you’re being stingy. Yield: This pastry recipe makes enough for one nice and thick deep dish bottom crust plus some scraps for decorations, or two relatively thin non-deep dish bottom crusts. I did the two thin crusts, and they were perfectly sturdy to hold up the pies, but if you like a thick crust, I’d recommend doubling the recipe. Whisk together all dry ingredients. 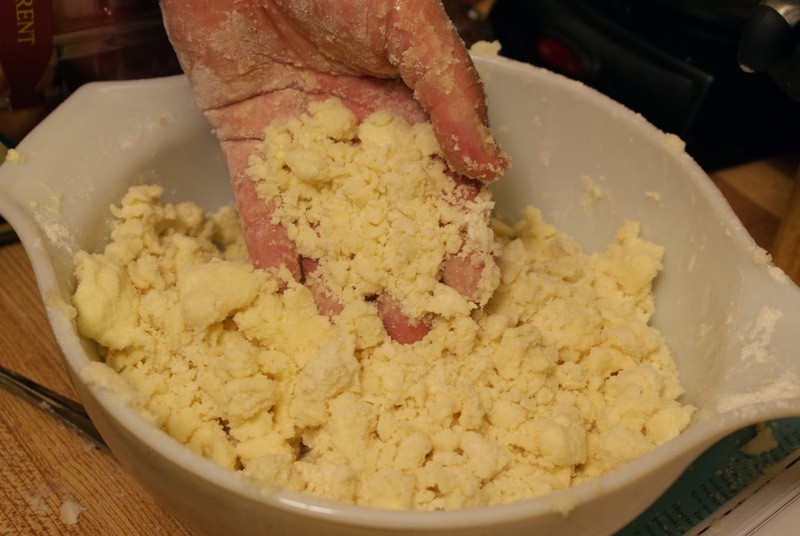 Cut in butter with a pastry cutter or two butter knives (or your fingers like I do, but that takes a light, deft touch) until pastry is an even, crumbly texture. 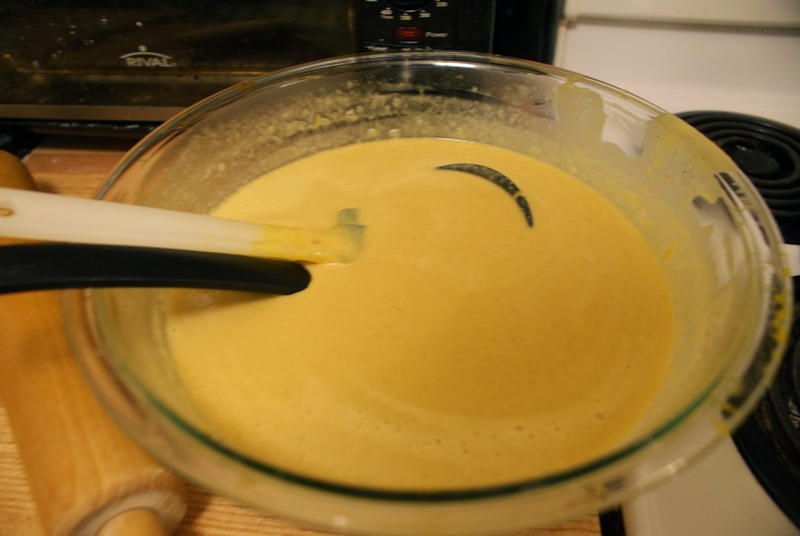 Whisk together beaten egg and 3 tbsp of the milk; add to the dough and mix with a strong wooden spoon (DO NOT USE an electric mixer or you risk overworking the dough) until dough comes together, adding additional milk if needed. Shape the dough into a disk; wrap and chill for 30 minutes. Whisk all dry ingredients (including lemon zest) into a large bowl. Mix in the eggs, and then the pumpkin puree (cooled to room temp if you have made your own) and apple butter. Add the cream and whisk all together until well-combined. Preheat oven to 425 degreesF. Roll out pastry to just less than 1/4″ thick on a lightly floured surface (a flat pastry board or a clean countertop). 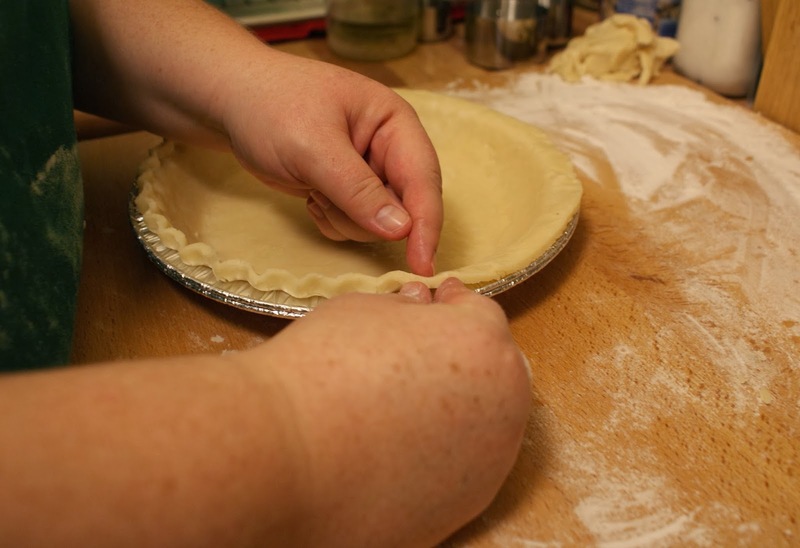 Ensure the pastry is rolled out to larger than your chosen pie plate. Gently roll up your pastry onto the rolling pin, brushing off excess flour from the bottom side as you go, and place over the pie plate. Ease the pastry in and around the sides and bottom, without stretching the dough (stretching causes dough to shrink and crack in the oven). If you have cracks, seal them by gently pinching together, or in extreme cases, using a little excess dough to seal the crack. There should be an overhang of at least an inch on all sides. 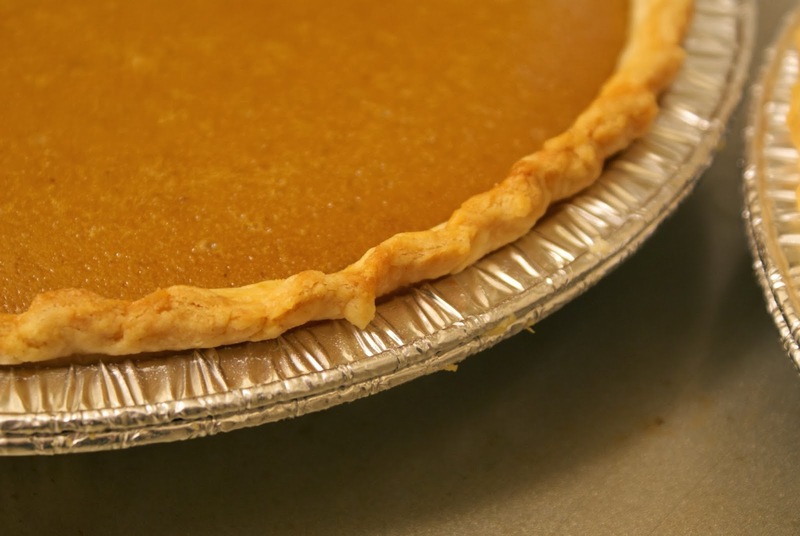 Take a small, sharp knife, and slice off the excess pastry around the outer edge of the pie plate, making sure to keep enough to make a nice, fluted edge. Put aside scraps. Take reserved egg white, mix lightly with a fork, and lightly brush the inside of the pastry up to the cut edge; this will help to seal any cracks and prevent any filling from seeping. Decorate the edge of the pastry in any manner you like. 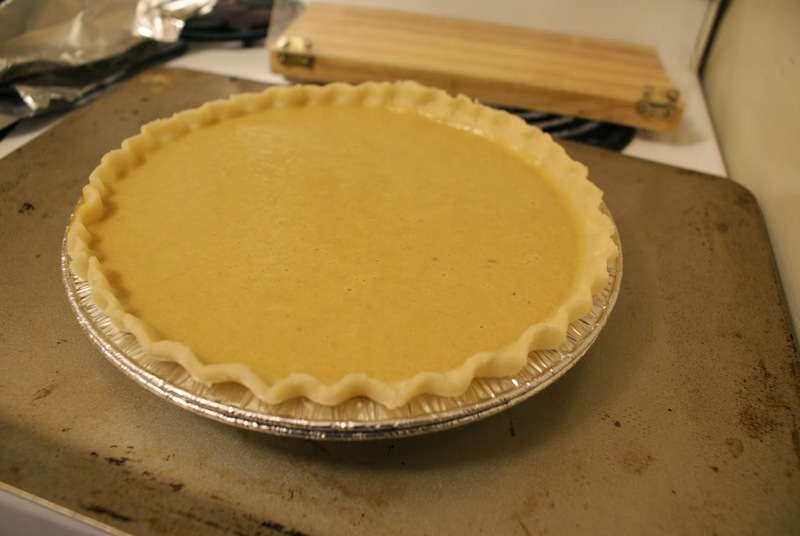 Fill pastry with your pie filling, up to the bottom edge of your fluting. To ensure my pie bottom didn’t burn, I doubled my pie plate and placed it on a flat cookie sheet. If you are using thicker, non-disposable plates, there is no need to double them up. Bake in oven for 15 minutes at 425 degreesF; then reduce the temp to 350 degreesF. Bake for 40-50 minutes, or until a knife inserted in the centre comes out clean, or they only wiggle slightly in the centre when moved, as opposed to slosh! Cool on a wire rack for about 2 hours; during this time, the filling will deflate some, which is normal. Best served with whipped cream. 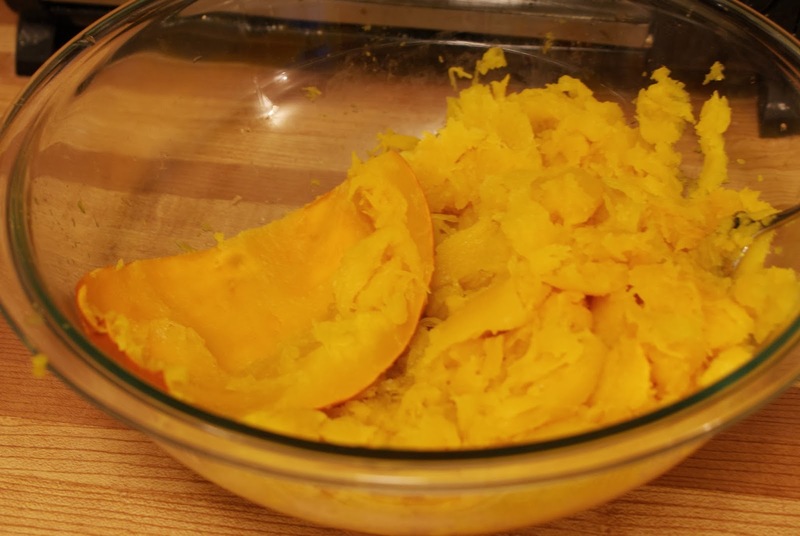 Don’t know how to cook a sugar pumpkin to make your own puree? It couldn’t be simpler, my little darlings! I don’t mess around with roasting or baking or steaming on the stovetop; they all take too long, and I’m already making pies, here; let’s not make this any more drawn out than it has to be, right? And I must admit, I love the bright orange-yellow of a steamed pumpkin flesh so much more than the dark rusty orange of a roasted pumpkin; it looks too much to me like that glop that comes out of cans, and if I’m going to the effort of making my own pumpkin puree, I want it to look and smell and taste completely different (and better)! One 4 lb. 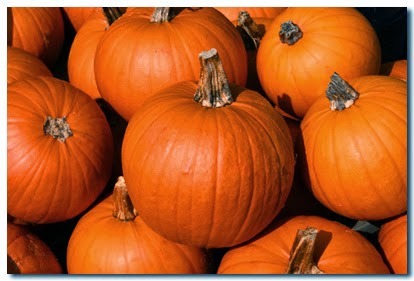 sugar pumpkin usually yields about 2 cups of puree, which is enough for two generous deep-dish apple butter pumpkin pies, or two regular sized pumpkin pies (just increase the spices in the filling recipe if you are leaving out the apple butter). 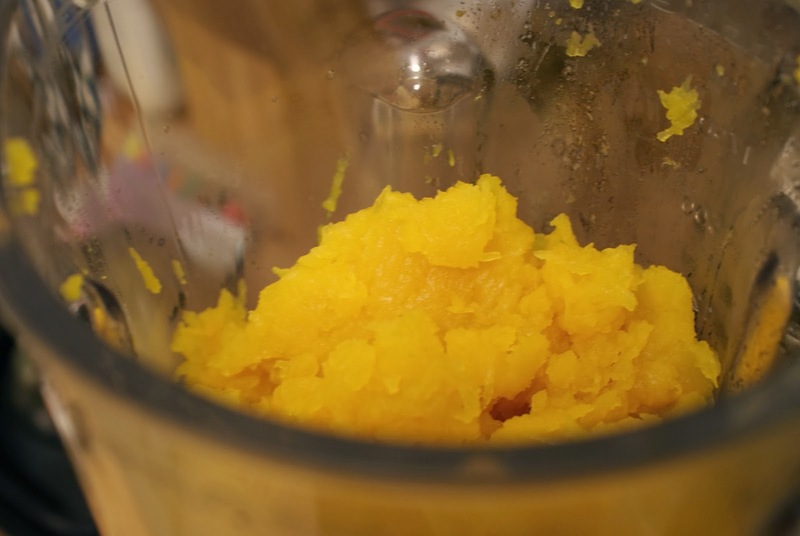 Super simple recipe for pumpkin puree: wash and halve your pumpkin. 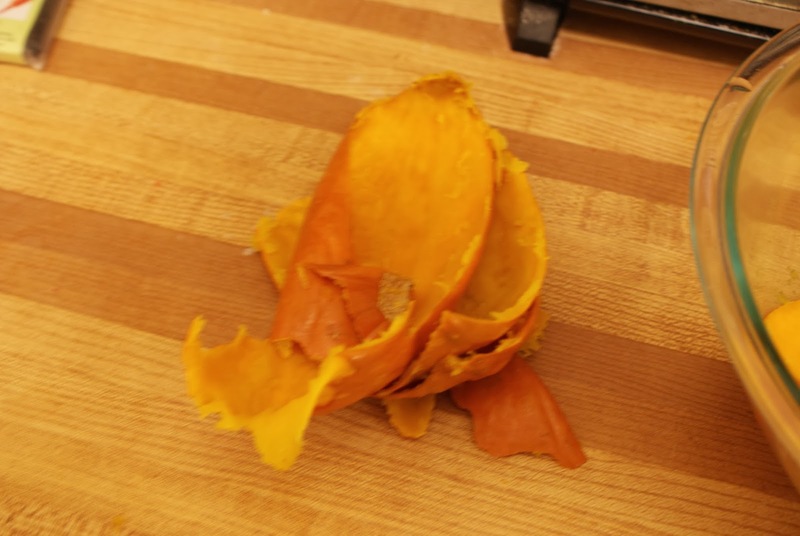 Scoop out the seeds and membranes and discard (or clean and make toasted pumpkin seeds; your call). Cut into quarters, place into a large glass bowl, add 1/4 cup of water, cover with plastic wrap with some holes poked through, and toss in your microwave for 3-4 rounds of five minutes on high. After each 5 minute increment, pull them out, poke holes in them with a fork to test their doneness, move them around a bit, then cover and repeat until they’re fork-tender. Pull them out and let them sit on the counter, uncovered until they’re cool enough to handle (10-15 minutes), then discard the water collected at the bottom of the bowl, and scrape off the flesh from the rind with a spoon. Mash the pumpkin flesh until desired texture is achieved. 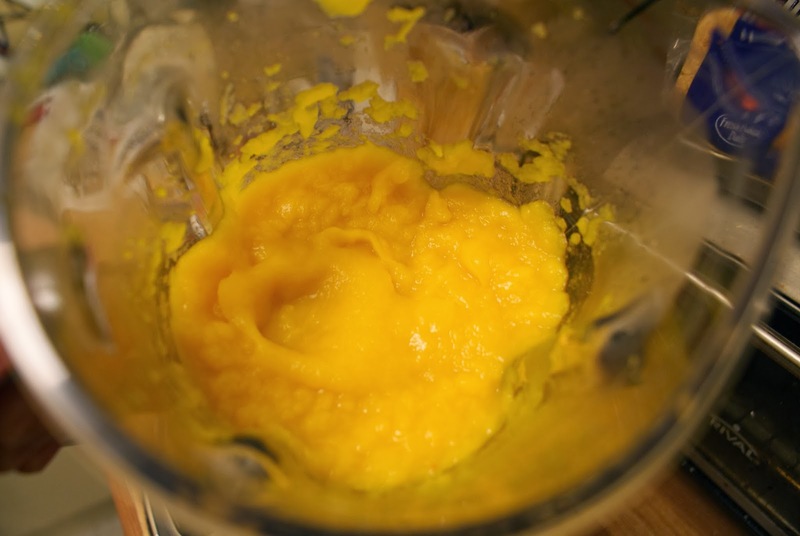 A regular potato masher won’t cut it; you’ll need to use a food mill or chinois, or do as I did and use your blender (or a food processor) to achieve perfect silky smoothness.